Jenny Kane - jkane@shawmedia.com McHenry County Conservation District volunteers John Carol talks to a tour group about the origins of the maple syrup production during the annual Festival of the Sugar Maples in Marengo. 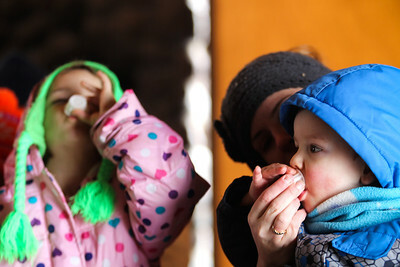 Jenny Kane - jkane@shawmedia.com Jenny Vogt feeds a sample of maple syrup to her son Adam Vogt, 2, while Katie Vogt, 7, (left) eats her sample during a tour at Festival of the Sugar Maples at Coral Woods Conservation Area in Marengo.The McHenry County Conservation District held the event. 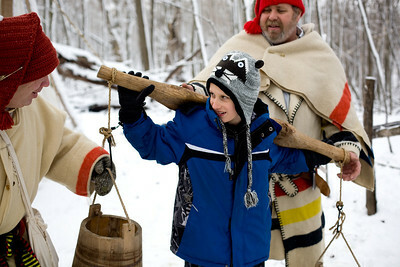 Jenny Kane - jkane@shawmedia.com Kyle Ochwat, 8, tries to hold an uneven yoke as McHenry County Conservation District volunteers John Carol, (left) and Dan MacKenzie, (right) talk about the origins of the maple syrup production at the annual Festival of the Sugar Maples in Marengo. Jenny Kane - jkane@shawmedia.com McHenry County Conservation District volunteer Warren Spencer, of Crystal Lake shows a tour group how the collection process of maple sap begins during the Festival of the Sugar Maples. Jenny Kane - jkane@shawmedia.com McHenry County Conservation District volunteer Phil Vogrinc, of Woodstock, holds open a collection pale so that A.J. 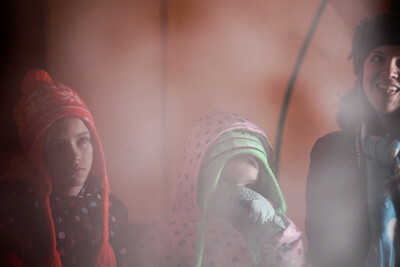 Paige, 9, (left), Kyle Ochwat, 8, (center) and Rita Dubas, (right) could taste the maple sap during the Festival of the Sugar Maples at Coral Woods Conservation Area in Marengo. 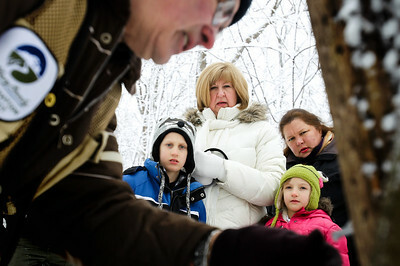 Jenny Kane - jkane@shawmedia.com McHenry County Conservation District volunteer Phil Vogrinc, of Woodstock, explains the maple sap collection process as Kyle Ochwat watches his grandmother Rita Dubas feed his sister Avery Ochwat a taste of maple sap during the Festival of the Sugar Maples at Coral Woods Conservation Area in Marengo. 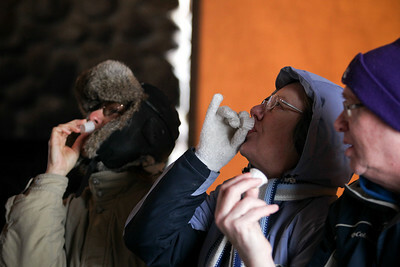 Jenny Kane - jkane@shawmedia.com Judy Wooderson, (left) Nancy Saxton, (center) and Rick Saxton, (right) try a sample of maple syrup during their tour at McHenry County Conservation District's annual Festival of the Sugar Maples at Coral Woods Conservation Area in Marengo. Jenny Kane - jkane@shawmedia.com Avery Ochwat, 6, tries a sample of maple syrup during a tour at the Festival of the Sugar Maples at the Coral Woods Conservation Area in Marengo. Jenny Kane - jkane@shawmedia.com Rita Dubas holds on to her granddaughter Avery Ochwat's hand during a tour at the Festival of the Sugar Maples at the Coral Woods Conservation Area in Marengo. 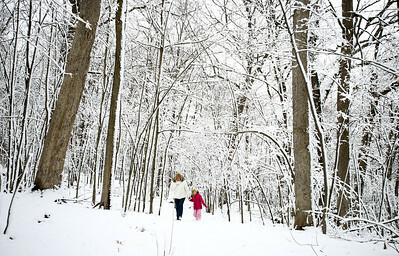 Jenny Kane - jkane@shawmedia.com Jordan Parker plays in the snow with his son Dylan Parker after the Festival of the Sugar Maples tour at Coral Woods Conservation Area in Marengo. 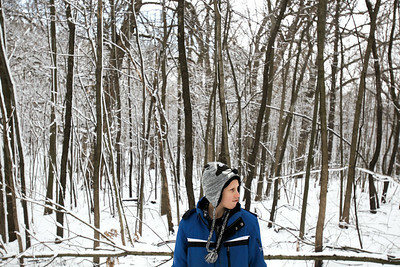 Jenny Kane - jkane@shawmedia.com Lucas Parker tastes a snowball after the Festival of the Sugar Maples at Coral Woods Conservation Area in Marengo. Jenny Kane - jkane@shawmedia.com Jenny Vogt, (right) and her daughters Katie Vogt, 7, (center) and Julia Vogt, 9, (left) watch a demonstration of the maple syrup production process during their tour at Festival of the Sugar Maples at Coral Woods Conservation Area in Marengo. 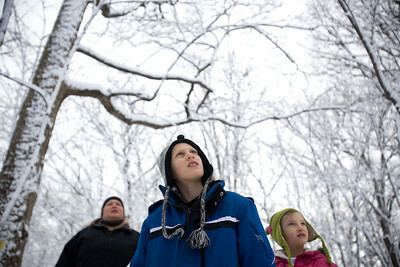 Jenny Kane - jkane@shawmedia.com Kyle Ochwat, 8, (center), his sister Avery Ochwat, 6, (right) and Heidi Marie Paige, (left) look into the trees at Coral Woods Conservation Area as volunteer Phil Vogrinc, of Woodstock, explains how to spot a Maple tree. The McHenry County Conservation District held its annual Festival of the Sugar Maples at Coral Woods Conservation Area in Marengo. Jenny Kane - jkane@shawmedia.com Jenny Vogt feeds a sample of maple syrup to her son Adam Vogt, 2, during a tour at Festival of the Sugar Maples at Coral Woods Conservation Area in Marengo. The McHenry County Conservation District held the event. Jenny Kane - jkane@shawmedia.com McHenry County Conservation District volunteer CJ Gillett breaks apart a stick for the camp fire while waiting for another tour group to begin during the annual Festival of the Sugar Maples at Coral Woods Conservation Area in Marengo. 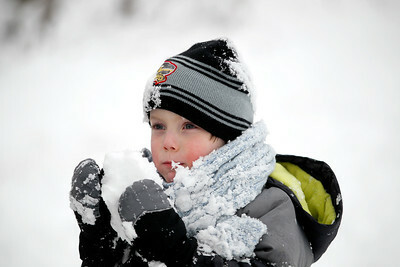 Jenny Kane - jkane@shawmedia.com Dylan Parker, (center) watches as his father Jordan Parker throws a snowball at his mother Jennifer Parker after the Festival of the Sugar Maples tour at Coral Woods Conservation Area in Marengo. Jenny Kane - jkane@shawmedia.com Lucas Parker makes a snow angel after the Festival of the Sugar Maples at Coral Woods Conservation Area in Marengo. 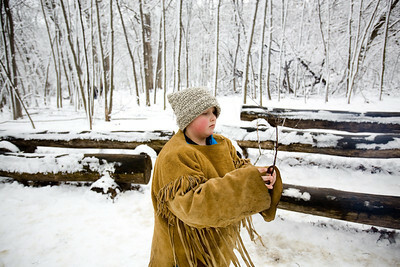 Jenny Kane - jkane@shawmedia.com Kyle Ochwat, 8, waits for his tour group to catch up to him at the Coral Woods Conservation Area during the McHenry County Conservation District's annual Festival of the Sugar Maples in Marengo. 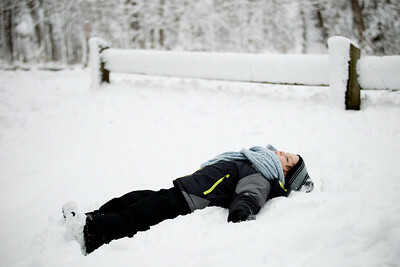 Jenny Kane - jkane@shawmedia.com Kyle Ochwat, 8, lays in the snow while his tour group looks at the maple sap collection process at the Coral Woods Conservation Area The McHenry County Conservation District held its annual Festival of the Sugar Maples in Marengo. 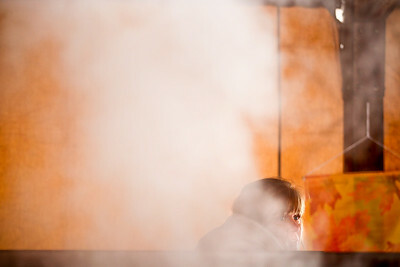 Jenny Kane - jkane@shawmedia.com The McHenry County Conservation District volunteer Teresa Henning waits to hand out samples of maple syrup made at the Coral Woods Conservation Area in Marengo during the annual Festival of the Sugar Maples. 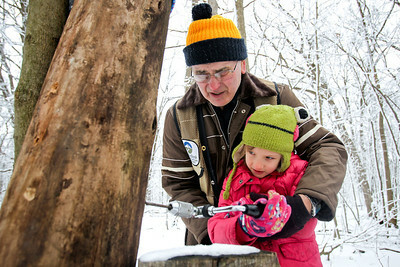 Jenny Kane - jkane@shawmedia.com McHenry County Conservation District volunteer Warren Spencer, of Crystal Lake, helps Avery Ochwat, 6, of Cary, drill a hole into a stump. Spencer explained to groups at the Festival of the Sugar Maples the proper size that a hole needs to be in order to get sap from a sugar maple tree at the Coral Woods Conservation Area in Marengo. Kyle Ochwat, 8, tries to hold an uneven yoke as McHenry County Conservation District volunteers John Carol, (left) and Dan MacKenzie, (right) talk about the origins of the maple syrup production at the annual Festival of the Sugar Maples in Marengo.